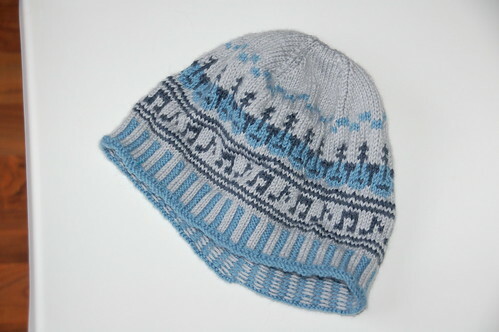 I finally got around to uploading some pictures of a couple of knitting gifts from...oh, last fall. Talk about lazy! But I made up for some of that laziness today by recording TWO videos on knitting cast on techniques for left handed knitters. I will admit that I only thought about making the video because I forgot how to do one of the techniques, and since there aren't too many instructions out there for left-handed knitters, I thought I'd make a "real" video and upload it to YouTube for other left-handed knitters out there. First the knitting gifts. I made this hat for a friend who likes to play guitar. The yarn is "Allround" by Wolle Rödel, a German yarn I bought locally. 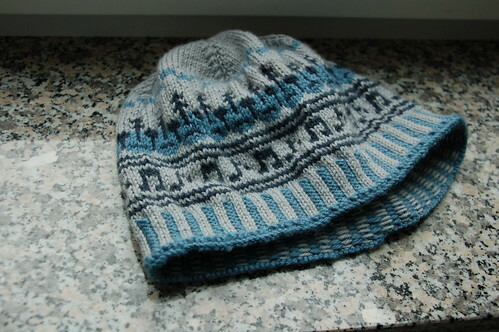 I used a pattern, which was created by a German woman, coincidentally. I bought it from Revelry. I don't know if you can tell that the motif above the musical notes is a row of guitars. The other gift is a cowl. The pattern, available here, is called "Burberry Inspired Cowl Neck Scarf," because the designer was inspired by one she'd seen sold by Burberry for $750. Yes, $750. I made this scarf out of Lana Grossa Alta Moda Cashmere, which is actually a wool/cashmere blend. 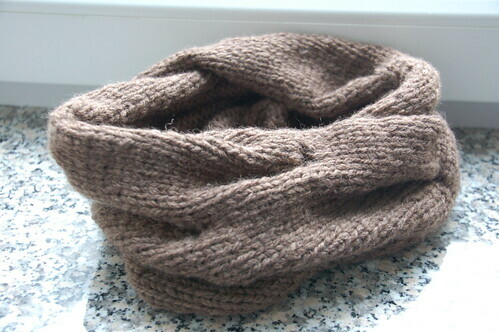 The cowl has large cables knit into it to give it some texture. And now for the videos. The first video demonstrates the "Old Norwegian Cast On" - also called "Twisted German" or "Elastic Long-Tail." This makes a stretchy cast on edge. This is the cast on that I couldn't remember how to do and after only finding videos of the technique for right-handers I thought I'd make one for left-handers. After having some fun making this, I thought I'd make one for the regular "Long Tail Cast On." That music hat is really cute.